In Federalist #23 Alexander Hamilton explains why a powerful, energetic government is necessary for the preservation of the United States. By December 18, 1787, Alexander Hamilton would have certainly heard that Pennsylvania had become the second State to ratify the Constitution. With this boost to his confidence, Hamilton published Federalist #23. This Paper begins a general transition in the overall theme of the Federalists from criticizing the Articles of Confederation to promoting the benefits of the Constitution. Alexander opens this new segment by outlining three points which this and the ensuing Papers will cover. These topics are: what the government should do, how to give the government the authority to carry out these tasks, and who exactly in the government should be given this authority. Hamilton’s focus of Federalist #23 concerns the primary examples of what a government should be responsible for. These include the assembling of a military force, the ability to influence the economy, and the power to negotiate treaties with foreign nations. As for a military force, Alexander argues that the government must be allowed to raise both an Army and Navy as well as make the rules which regulate those bodies. This is to guard against outside invasion as well as internal uprising. Toward the economy, the influence of the government should steer a nation in the direction of greater wealth, or at the very least, away from bankruptcy of collapse. And finally, the power to negotiate treaties will allow a country to reap the benefits of trade as well as secure a stable peace with other nations. As for his second and third points, Hamilton gives only a brief overview of what is to come in future Papers. Actually, he leaves out discussions of the third point (who is responsible) entirely. Speaking on how to give authority to the government, Hamilton obvious promotes the methods used in the proposed Constitution. An energetic Central Government should be able to command what it needs from the States by having the authority to make laws directly effecting the people. As usual, the Anti-Federalist arguments to Hamilton’s Paper are pretty straight forward. If the Federal Government is given too much power, how could the people ever reign it in if things became too tyrannical? Although this did not seem to concern Hamilton, it is a question that has been struggled with throughout American history. Have yo missed some of our previous Federalist Fridays? Catch up with our previous articles here. Want to read my favorite biography of Hamilton? There are hundreds of Hamilton books on Amazon and for some reason this one is real far down the list. 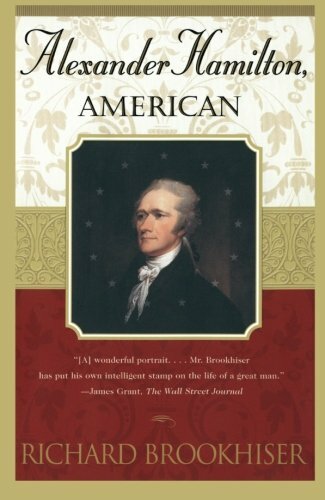 ‘Alexander Hamilton, American’ was written by Richard Brookhiser who is, in my opinion, one of the best modern biographers of the Founding Fathers. Pick up a copy through the Amazon affiliate link below (you’ll support this site, but don’t worry, Amazon pays me while your price stays the same).